Chamosite: Mineral information, data and localities. A fairly common member of the chlorite group. Originally reported from Brittany, France. Daphnite A magnesian variety of chamosite. Originally reported from Penzance - Ludgvan Area, Mount's Bay District, Cornwall, England, UK. Strigovite Fine-grained variety of chamosite from Strzegom (Striegau), Silesia. Thuringite A ferroan variety of Chamosite, first reported from Reichmannsdorf, Thuringian Forest, Thuringia, Germany. Quartz 43 photos of Chamosite associated with Quartz on mindat.org. Pyrite 18 photos of Chamosite associated with Pyrite on mindat.org. Fluorite 14 photos of Chamosite associated with Fluorite on mindat.org. Titanite 10 photos of Chamosite associated with Titanite on mindat.org. Hematite 10 photos of Chamosite associated with Hematite on mindat.org. Albite 10 photos of Chamosite associated with Albite on mindat.org. Almandine 10 photos of Chamosite associated with Almandine on mindat.org. Epidote 10 photos of Chamosite associated with Epidote on mindat.org. Calcite 9 photos of Chamosite associated with Calcite on mindat.org. Smoky Quartz 7 photos of Chamosite associated with Smoky Quartz on mindat.org. Brindley, G. W. (1949): Mineralogy and crystal structure of chamosite. Nature 164 319-320. Brindley, G. W. (1951): The crystal structure of some chamosite minerals. Mineralogical Magazine 29, 502-522. Brindley, G. W. & Youell, R. F. (1953): Ferrous chamosite and ferric chamosite. Mineralogical Magazine 30, 57-70. Youell, R. F. (1955): Mineralogy and crystal structure of chamosite. Nature 176, 560-561. Delaloye, M. (1962): Chamosite of Chamoson, Valais. Schweizerische Mineralogische und Petrographische Mitteilungen 42, 644. Ershova, K. S.; Solntseva, L. S.; Umnova, E. G.; Shcherbak, O. V.; Dubakina, L. S. (1980): Complex study of the composition and properties of chamosite. Rentgenografiya Mineral'n. Syr'ya i ee Prikl. Znachenie, M. 165-179. Whittle, C. K. (1986): Comparison of sedimentary chlorite compositions by x-ray diffraction and analytical TEM. Clay Minerals 21, 937-947. Walker, J. R. & Bish, D. L. (1992): Application of Rietveld refinement techniques to a disordered IIb magnesian chamosite. Clays and Clay Minerals 40, 319-322. De Caritat, P., Hutcheon, I. & Walshe, J.E. (1993): Chlorite geothermometry: a review. Clays and Clay Minerals, 41, 219-239. Mohapatra, B. K.; Rath, P. C.; Sahoo, R. K. (1995): Chromiferous chamosite from Pokphur magnetite body, Nagaland, India. Current Science 68, 1036-1039. Wiewiora, Andrzej; Wilamowski, Andrzej; Lacka, Bozena; Kuzniarski, Michal; Grabska, Dorota (1998): Chamosite from oolitic ironstones: the necessity of a combined XRD-EDX approach. Canadian Mineralogist 36, 1547-1557. Vasileva, R. D. & Bonev, I. K. (2002): Hydrothermal manganoan chamosite from the vein and replacement Pb-Zn ore deposits, Madan district, Bulgaria. Geokhimiya, Mineralogiya i Petrologiya 39, 81-93. The following Chamosite specimens are currently listed for sale on minfind.com. Bull. Minéral., 1988, 111, pp. 183-206. Victorio Angelelli (1984). Yacimientos de minerales de hierro. Smithsonite,calcite and chamosite only from specimens seen on sale from Erocks labelled from the mine- http://erocks.com/locality/83045/home-bullion-mine-barrow-creek. Du Puy, K. (2003) Descriptive hydrothermal alteration model for the Thunderbox gold deposit: insights into timing of gold mineralisation relative to deformation and metamorphism. Unpublished Honours thesis, University of Western Australia. 88pp. Kolitsch, U. (2015): 1938) Almandin, Anglesit, Bechererit(? 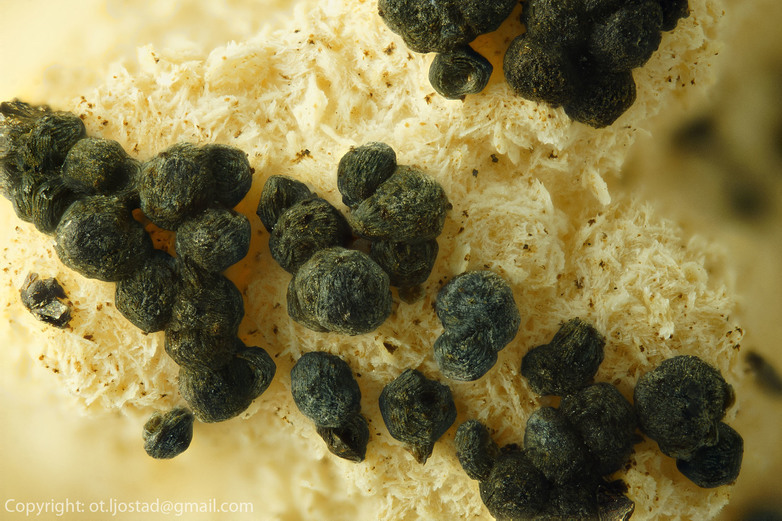 ), Brianyoungit, Chamosit, Fluorapatit, Ilmenit, Kassiterit, Segnitit, Stannit und Zirkon vom Arzberg bei Kottaun, Geras im Waldviertel, Niederösterreich. P. 250 in Niedermayr, G. et al. (2015): Neue Mineralfunde aus Österreich LXIV. Carinthia II, 205./125., 207-280. Kolitsch, U. & Schillhammer, H. (2015): 1939) Almandin, Chalkopyrit, Chamosit, Covellin, Epidot, Pyrit, Sphalerit und Titanit vom Steinbruch Vorderleitner, Fuchsberggraben bei Irnfritz-Messern, Waldviertel, Niederösterreich. Pp. 250-251 in Niedermayr, G. et al. (2015): Neue Mineralfunde aus Österreich LXIV. Carinthia II, 205./125., 207-280. Kolitsch, U., Schillhammer, H. & Lamatsch, P. (2015): 1936) Analcim, Axinit-(Fe), Chamosit, Datolith, Gips, Heulandit-Ca, Hyalit, Jarosit, Klinochlor, Klinoptilolith-Ca, Laumontit, Malachit, Molybdänit, Siderit, Sphalerit und Uraninit vom Steinbruch Hengl bei Eibenstein an der Thaya, Waldviertel, Niederösterreich. Pp. 243-245 in Niedermayr, G. et al. (2015): Neue Mineralfunde aus Österreich LXIV. Carinthia II, 205./125., 207-280.; Kolitsch, U., Schillhammer, H. and Lamatsch, P. (2016): 1986) Allanit-(Ce), Almandin, Aragonit, Chabasit, Dravit, Ilmenit, Magnesit, Monazit-(Ce), Xenotim-(Y) und Zirkon vom Steinbruch Hengl, Eibenstein an der Thaya, Waldviertel, Niederösterreich. Pp. 231-232 in Walter, F. et al. (2016): Neue Mineralfunde aus Österreich LXV. Carinthia II, 206./126., 203-250. Kolitsch, U. (2014): 1875) Chamosit und Gladit aus den Deponien des Kraftwerkbaues im hinteren Gasteinertal (Sportgastein), Salzburg. P. 112 in Niedermayr, G. et al. (2014): Neue Mineralfunde aus Österreich LXIII. Carinthia II, 204./124., 65-146. Kolitsch, U. (2013): 1800) Chamosit vom Hopffeldboden im Obersulzbachtal, Salzburg. P. 114 in Niedermayr, G. et al. (2013): Neue Mineralfunde aus Österreich LXII. Carinthia II, 203./123., 91-146. Niedermayr, G. (2000): 1225. Coelestin und Strontianit, neben Calcit, Chamosit, Pyrit und Quarz aus dem Kraftwerksstollen bei Muhr im Lungau, Salzburg. Pp. 209-210 in Niedermayr et al. : Neue Mineralfunde aus Österreich XLIX. Carinthia II, 190./110, 181-224. Brandstätter, F., Niedermayr, G., Strobl, M., Walter, F. (2014): 1851) Brookit sowie Albit, Calcit, Chlorit (Chamosit) und Quarz vom Nenzinger Himmel im Gamperdonatal bei Nenzing, Vorarlberg. Pp. 86-88 in Niedermayr, G. et al. (2014): Neue Mineralfunde aus Österreich LXIII. Carinthia II, 204./124., 65-146. Kolitsch, U. (2015): 1925) Chalkopyrit, Chamosit, Chrysokoll, Epidot, Hämatit, Jarosit, Magnetit, Malachit, Pyrit, Quarz und Stellerit vom Eisenbergbau im Luterseegebiet (Alpe Netza), Gortipohl im Montafon, Vorarlberg. Pp. 228-229 in Niedermayr, G. et al. (2015): Neue Mineralfunde aus Österreich LXIV. Carinthia II, 205./125., 207-280. Kolitsch, U. (2013): 1795) Bastnäsit(? )-(Ce), Chamosit, Chrysokoll, SEE-haltiger Epidot, Fluorit, Schwefel und andere Mineralien vom alten Bergbau am Fellimännle, Rindertal (Gaflunatal) im Montafon, Vorarlberg. P. 107 in Niedermayr, G. et al. (2013): Neue Mineralfunde aus Österreich LXI. Carinthia II, 203./123., 91-146. José Dehove collection. ; Mélon, J., Bourguignon, P., and Fransolet, A.M. (1976) Les minéraux de Belgique. Edition G. Lelotte, Dison (Belgium), 283 pp. ; Hatert, F., Fransolet, A.-M., and Houssa, M. (1996) La titanite de Bastogne (Belgique) et les minéraux associés. Bulletin de la Société Royale des Sciences de Liège, 65(6), 387-397.; Hatert, F., Deliens, M., Houssa, M., and Coune, F. (2000) Native gold, native silver and secondary minerals in the quartz veins from Bastogne, Belgium. Bulletin de l'Institut royal des Sciences naturelles de Belgique, Sciences de la Terre, 70, 223-229. Econ Geol (1997) 92:623-632; Dill, H.G. (1998): Mineralium Deposita 33, 359-378. Klein, E.L., Alves dos Santos, R., Fuzikawa, K., and Angélica, R.S. (2001): Mineralium Deposita 36, 149-164. Tarkian, M., & Breskovska, V. (1989). Greenockite from the Madjarovo Pb-Zn ore district, Eastern Rhodope, Bulgaria. Mineralogy and Petrology, 40(2), 137-144. Damyanov, Z. K. (1998). Ore petrology, whole-rock chemistry and zoning of the Kremikovtsi carbonate-hosted sedimentary exhalative iron (+ Mn)-barite-sulfide deposit, Western Balkan, Bulgaria. Neues Jahrbuch für Mineralogie-Abhandlungen, 1-42.; Damyanov, Z., & Vassileva, M. (2001). Authigenic phyllosilicates in the Middle Triassic Kremikovtsi sedimentary exhalative siderite iron formation, Western Balkan, Bulgaria. Clays and Clay Minerals, 49(6), 559-585. Kelvin F.E. Anderson, Frances Wall, Gavyn K. Rollinson, Charles J. Moon (2014): Quantitative mineralogical and chemical assessment of the Nkout iron ore deposit, Southern Cameroon. Ore Geology Reviews, 62, 25-39. SABINA, A.P. (1976): Rocks & minerals for the collector: The Magdalen Islands, Quebec and the island of Newfoundland. Geological Survey of Canada Paper 75-36, 199p. Reissued in 2003 as Île de la Madeleine, Quebec, the Island of Newfoundland and Labrador. Geological Survey of CanadaMiscellaneous Report 58, 49-51.
catalogue of canadian minerals by r. j. traill; G. Pouliot, J. A. Maxwell, and S. C. Robinson (1964): Cenosite from Bancroft, Ontario. Canadian Mineralogist 8, 1-10. HORVÁTH, L., PFENNINGER-HORVÁTH, E. (2006) Brookite et anatase à Saint-Pierre-de-Broughton, Québec, Canada: Une minéralisation de type “fentes alpines.” Le Règne Minéral, No.71, 28-42 (in French). Normand (2001) Experimental and field investigation of serpentinization and rodingitization. unpublished Ph.D. thesis McGill University, Montreal, Quebec. HORVÁTH, L., PFENNINGER-HORVÁTH, E. and SPERTINI, F. (2013) The Jeffrey mine, Asbestos, Québec, Canada: A mineralogical review. Mineralogical Record, 44, 375-417. Tavchandjian, O. (1992). Analyse quantitative de la distribution spatiale de la fracturation et de la minéralisation dans les zones de cisaillement: applications aux gisements du complexe du lac Dore (Chicougamau-Québec). Université du Québec à Chicoutimi. Youli Feng, Lijing Yu, and Ruizhong Hu (2006): Journal of The Virtual Explorer 24(2). Jin Zhangdong, Zhu Jinchu, Ji Junfeng, Lu Xinwei, and Li Fuchun (2001): Science in China, Series D (Earth Sciences), 4(2), 177-184. Filip, J., Kolitsch, U., Novák, M., & Schneeweiss, O. (2006). The crystal structure of near-end-member ferroaxinite from an iron-contaminated pegmatite at Malešov, Czech Republic. The Canadian Mineralogist, 44(5), 1159-1170. Fojt B.: Ba-minerály železnorudné mineralizace na stratiformním sulfidickém ložisku Horní Benešov v Nízkém Jeseníku. Minerál, 2013, roč. 21, č. 4, s. 311-312. Kučera, J. Kučerová - Charvátová, K., Škoda, R.: Nové výskyty minerálů na hydrotermálních žilách Nízkého Jeseníku. Bulletin mineralogicko-petrografického oddělení Národního muzea v Praze, 2007, roč. 14-15, s. 69-72. Zimák, J., Novotný, P., & Dobeš, P. (2005). Hydrothermal mineralization at Domašov nad Bystřicí in the Nízký Jeseník Uplands. Bulletin of Geosciences, 80(3), 213-221. Zimák, J.: Chemistry of chlorites from hydrothermal veins in the Variscan flysch sequences of the Nízký Jeseník Upland (Czech Massif). Bulletin of the Czech geological survey, 1999, vol. 74, no. 1, s. 43-46. Novotný, P., Zimák, J.: Petrov nad Desnou – Petrovský vrch. In Exkurzní průvodce po mineralogických lokalitách na Sobotínsku. Univerzita Palackého v Olomouci, 2002, Olomouc, s. 9-11. Pauliš, P.: Prachovice v Železných horách - nejvydatnější české naleziště kalcitu. Minerál, 1998, roč. 6, č. 1, s. 18-21. Litochleb, J., Sejkora, J., Šrein, V.: Amalgamy stříbra - moschellandsbergit a schachnerit ze železnorudného ložiska Březina u Radnic (západní Čechy). Bulletin mineralogicko-petrografického oddělení Národního muzea v Praze, 2001, roč. 9, s. 225-229. Víšková E., Fojt, B., Hrazdil, V., Houzar, S., (2013): Mineralogie magnetit-grunerit-sideritového zrudnění z Radoškova (jednotka Bílého potoka, svratecká klenba, moravikum). Acta Musei Moraviae, Sci. geol., 98, 2, 39–50. Cook, N. J., Sundblad, K., Valkama, M., Nygård, R., Ciobanu, C. L., & Danyushevsky, L. (2011). Indium mineralisation in A-type granites in southeastern Finland: insights into mineralogy and partitioning between coexisting minerals. Chemical Geology, 284(1-2), 62-73. De Ascencao Guedes, R. et Devouard, B,2011. Le Règne Minéral,101, p.5-16. Chauris, L. (2014): Minéraux de Bretagne, Les Editions du Piat, 42. David J. Barber (1985). Phyllosilicates and other layer-structured materials in stony meteorites. Clay Minerals 20, 415-454 (1985). von Gehlen, K., and Harder, H. (1956): Contributions to Mineralogy and Petrology 5, 118-138. Harder, H. (1954): Contributions to Mineralogy and Petrology 4(1/2), 54-66. Ciriotti, M.E., Preite, D., Blaß, G., Möckel, S., Piccoli, G.C. (2007): Chamosite, una novità per due classiche località italiane. Micro, 1/2007, 39-42. Guastoni, A., Gentile, P., Nestola, F., Zorzi, F. (2017): Agardite-(Y), agardite-(Ce) e agardite-(Nd) di Cuasso al Monte, Varese. Rivista Mineralogica Italiana, 41, 4 (4-2017), 228-232. Lovisato, D. (1913): Le specie minerali finora trovate nelle granuliti di Cala Francese all'isola di La Maddalena. Memorie della Regia Accademia dei Lincei, serie V, 10, 403-436. Benvenuti, M., Brizzi, G., Dini, A. (1993): La miniera piombo-argentifera del Bottino (LU). (2a parte). Rivista Mineralogica Italiana, 1/1993, 1-22. Pegoraro S. (2014): Miniere e minerali dell'Alto Vicentino. AMI Ed. 393 pagg. -Atti della giornata di Studio – L’argento e le “terre bianche” del Tretto e della val Leogra – Comune di Schio, 2000. A cura di Pietro Frizzo. Akira Kato (2011) Explanations of distributed specimens at the Ordinary Meeting of Mumeikai Group, No. 34 (January, 2011). Seki, Y., and Yamasaki, M. (1957): American Mineralogist 42, 506-520. Nakamura, T. & Aikawa,N. (1973) Journal of Geosciences, Osaka City University, 16, 1-10. Ryoichi SADANAGA and Michiaki BUNNO (1974) THE WAKABAYASHI MINERAL COLLECTION Bulletin No. 7 The University Museum, The University of Tokyo; University of Tokyo collection, specimens No. IX-309—No. IX-315. Carles Canet, Eduardo González-Partida, Antoni Camprubí, Jesús Castro-Mora, Francisco Martín Romero, Rosa María Prol-Ledesma, Carlos Linares, Juan A. Romero-Guadarrama, Lilia I. Sánchez-Vargas (2011): The Zn–Pb–Ag skarns of Zacatepec, Northeastern Oaxaca, Mexico: A study of mineral assemblages and ore-forming fluids. Ore Geology Reviews 39, 277-290.
ⓘ Rancho Agua Blanca ? Cairncross, B. and Fraser, A. (2012) The Rosh Pinah lead-zinc mine. Roacks & Minerals, 87 (5), 398-407. Larsen, A. O. (ed.) (2010): The Langesundsfjord. History, geology, pegmatites, minerals. Bode Verlag Gmbh, Salzhemmendorf, Germany, 240 p; Kolitsch, U., Andresen, P., Husdal, T. A., Ertl, A., Haugen, A., Ellingsen, H. V. and Larsen, A. O. (2013): Tourmaline-group minerals from Norway, part II: Occurrences of luinaite-(OH) in Tvedalen, Larvik and Porsgrunn, and fluor-liddicoatite, fluor-elbaite and fluor-schorl at Ågskardet, Nordland. Norsk Bergverksmuseet Skrift 50, 23-41.
ⓘ Vevja 2 Quarry ? Mlynarczyk, M. S. (2005). Constraints on the Genesis of Lode-style Tin Mineralization: Evidence from the San Rafael Tin-copper Deposit, Peru (Doctoral dissertation, McGill University). Alves, P., Leal Gomes, C., Lopes Nunes, J.E (2012) : Produtos de evolução de triplite-zwieselite, fluorapatite e isokite da mina Sítio do Castelo (Folgosinho, Guarda). II Congresso Jovens Investigadores em Geociências, LEG 2012. Ciobanu, Cristiana Liana and Cook, Nigel John, 2003, Skarn Textures and A Case Study: The Ocna de Fier - Dognecea Orefield, Romania, Ore Geology Reviews, p. 315-370. Tsekhovskii, Y.G., Lavrushin, V.Y., Kuleshov, V.N., Shchepetova, E.V., Stukalova, I.E., Nosik, L.P., Prokof’ev, V.Y., and Areshin, A.V. (2002): Lithology and Mineral Resources 37(3), 210-227. Ivanov, O. K.; Shilova, T. A. (1978): Chromium-containing corundophilite from the Sarany chromite deposit (the Urals). Miner. Paragenezisy Miner. 1978, 144-147. Ozdín D., 2001: Metamorfno-hydrotermálne zrudnenie na výskyte Ľubietová - Predsvätodušná. Geologické práce, Správy, 105, 77-82. Ozdín D., 2003: Mineralógia a genéza sideritovej mineralizácie Ďumbierskych Nízkych Tatier. Manuscript (Dissertation thesis), Archive of Dpt. of Mineralogy and Petrology, Fac. of Natural Sc., Bratislava, 1-194. Ružička P., Mikuš T., Števko M., Bačík P. (2017): Zonálne amfiboly z kontaktnej zóny mramorov a metabazitov na lokalite Trohanka pri Prakovciach (Volovské vrchy, Slovenská republika). Bull. Mineral. Petrolog., 25, 1, 12-22 (in Slovak with English abstract). Ozdín D., 2009: Antimonitové ložisko Čučma. Minerál, 17, 5, 420-423. (in Slovak) Ozdín D., Volek M., Števko M., 2006: Study of hydrothermal veins with axinites from the Western Carpathians. Acta Min.-Petr., Szeged, 5, 87. Bong Chul Yoo, Hyun Koo Lee & Noel C. White (2010): Mineralogical, fluid inclusion, and stable isotope constraints on mechanisms of ore deposition at the Samgwang mine (Republic of Korea)— a mesothermal, vein-hosted gold–silver deposit. Mineralium Deposita 45, 161-187. Leistel, J.M., Marcoux, E., Thiéblemont, D., Quesada, C., Sánchez, A., Almodóvar, G.R., Pascual, E., and Sáez, R.(1998): Mineralium Deposita 33, 2-30. Fernández, A., and Moro, M.C. (1998): Mineralium Deposita 33, 606-619. Stalder, H. A., Wagner, A., Graeser, S. and Stuker, P. (1998): Mineralienlexikon der Schweiz. Wepf (Basel), p. 110. [Orthochamosite] Stalder, H. A., Wagner, A., Graeser, S. and Stuker, P. (1998): Mineralienlexikon der Schweiz. Wepf (Basel), p. 292. Doswald C., "Erzwege", Einsenerztransport in der vorindustriellen Schweiz. In Bergbau, Verhüttung und Waldnutzung im Mittelalter. Franz Steiner Verlag, Stuffgart, 151-172. Engel, R.F., Peacor, D.R., Kelly, W.C. (1978) A new 5C pyrrhotite. American Mineralogist, 63, 1274-1277. Berthier, P. (1820): Annales des Mines 5, 393-396; Delaloye, M. (1962): Chamosite of Chamoson, Valais. Schweizerische Mineralogische und Petrographische Mitteilungen 42, 644. Celebi, Hüseyin, Helvaci, Cahit & Uçurum, Ali (2010) Apatite-bearing magnetite deposit of Pinarbasi (Adiyaman): Geological, geochemical and economical potential. Mineral Res. Expl. Bull., 141, 27-52. Dines, H.G. (1956): The metalliferous mining region of south-west England. HMSO Publications (London), Vol. 1, pp. 317-326. Dines, H.G. (1956): The metalliferous mining region of south-west England. HMSO Publications (London), Vol. 1, p. 295. Grey, I.E., Kampf, A.R., Price, J.R. and Macrae, C.M. 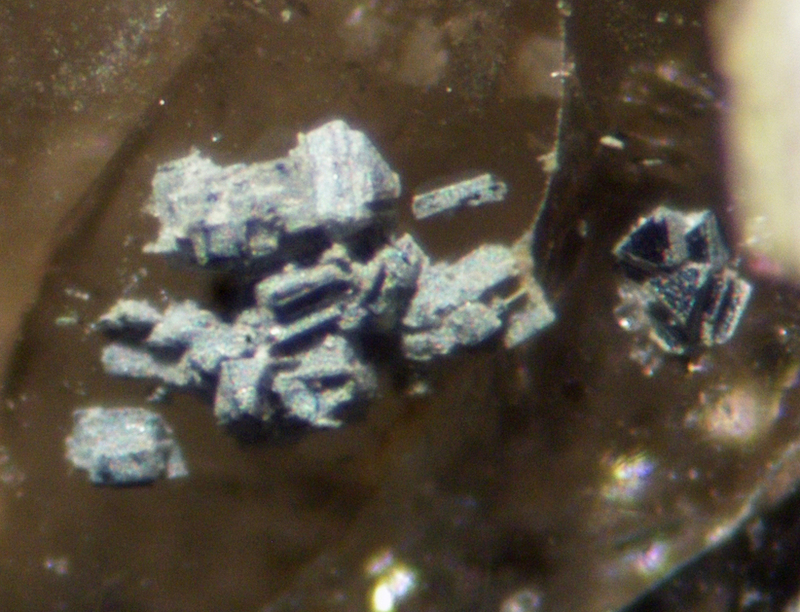 (2015): Bettertonite, [Al6(AsO4)3(OH)9(H2O)5]·11H2O, a new mineral from the Penberthy Croft mine, St. Hilary, Cornwall, UK, with a structure based on polyoxometalate clusters. Mineralogical Magazine 49, 1849-1858. Green, D.I. and McCallum, D. (2005) Kainosite-(Y) from the Strontian Mines, Highland Region, Scotland. UK Journal of Mines & Minerals, vol. 26, 23-26.; Green, D.I., Tindle, A.G., Hubbard, N., McCallum, D., and Jackson, B. (2008) Heulandite-Sr and heulandite-Ba, two zeolite group minerals new to Britain from Whitesmith Mine, Strontian, Highland Region, Scotland. Journal of the Russell Society, vol. 11, 80-86. Pavel M. Kartashov data; Lyckberg, P., Chornousenko, V. & Wilson, W. E. (2009): Volodarsk-Volynski, Zhitomir Oblast, Ukraine. Mineralogical Record, 40, 473-506. Anthony, J.W., et al (1995), Mineralogy of Arizona, 3rd.ed. : 167. Harrer, C.M. (1964), Reconnaissance of Iron Resources in Arizona, US Bureau of Mines Information Circular 8236: 45; MRDS database Dep. ID #10027285, MRDS ID #M002721. Anthony, J.W., et al (1995), Mineralogy of AZ, 3rd. ed.:167. Collected by Mr. Eckhard Stuart, 2007. Anthony, J.W., et al (1995), Mineralogy of Arizona, 3rd.ed. : 168; Anderson, C.A. & S.C. Creasy (1958), Geology and ore deposits of the Jerome area, Yavapai Co., AZ, USGS PP 308. Anderson, C.A. & S.C. Creasey (1958), Geology and ore deposits of the Jerome area, Yavapai Co., AZ, USGS PP 308: 93. Anthony, J.W., et al (1995), Mineralogy of Arizona, 3rd.ed. : 167-168. Williams, Henry S. and Gregory, Herbert E. (1900) Contributions to the Geology of Maine, U. S. Geological Survey Bulletin 165, pp 212. Mineralogy of Michigan, Heinrich, Robinson. Chlorite group minerals in the Keweenaw are in the chamosite- clinochlore series with the dark green to black being chamosite and the light tan to gray being clinochlore. Personal communication with George Robinson. Larry Maltby, The Mineralogy of Michigan, Henrich-Robinson describes the chlorite in Keweenaw Co. as chamosite forming a solid solution series with clinochlore. 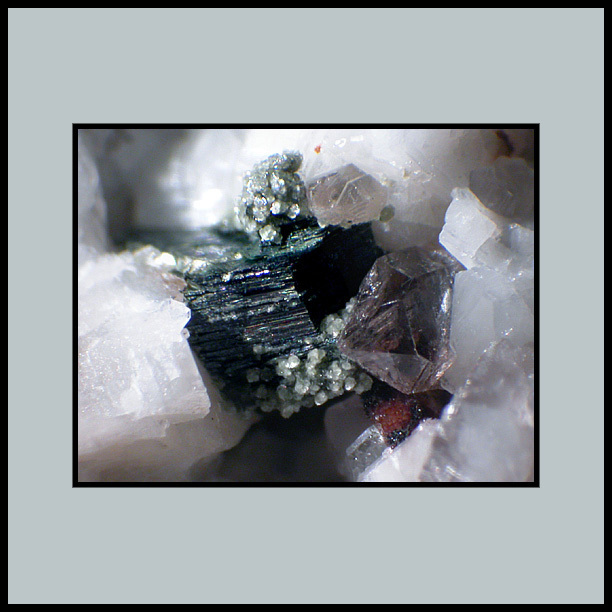 The dark green to black chlorite has consistently proven to be chamosite. Rocks & Min. : 16: 243, 247. Rocks & Min. : 16:243, 247. A. Plante collection; R. Janules collection; A. Smith collection; et.al. Steven C. Chamberlain & George W. Robinson (2013) Collector's Guide to the Minerals of New York State. Schiffer Books. Steve Chamberlain et al (2009) "Minerals of the Phosphate vein, Bower Powers Farm, Pierrepont, St. Lawrence Co., NY." The 36th Rochester Mineralogical Symposium, April 23-26, programme abstracts, 13-15.
van Horn, F. R., 1914, Notes on a New Occurrence of Pisanite and Arsenopyrite, and some Large Staurolite Crystals from the Ducktown District, Tennessee, American Journal of Science p. 40-47. Vivien Gornitz (2006) Mineral News, 22, #2, 10.